If you’re leaving your job, you will need to tie up lots of loose ends. Leaving a positive impression on your colleagues is vital. How do you gracefully notify colleagues of your departure? Let’s talk about the perfect farewell message. Sending farewell messages too early is a bad idea. People will inevitably stop by your office to wish you well face-to-face, and that could interfere with finishing up your last work tasks. After coworkers have said their goodbyes, they may feel awkward when they see you lurking about for another week. On the other hand, if you wait until the last minute, they may not have time to say a proper farewell. When is the best time? A day or two before your last day, when you’ve completed the majority of your duties, is a fitting time to send out a parting email. Then, when your fellow workers bid you farewell, you’ll have a chance to spend a few moments with each one on a personal basis. 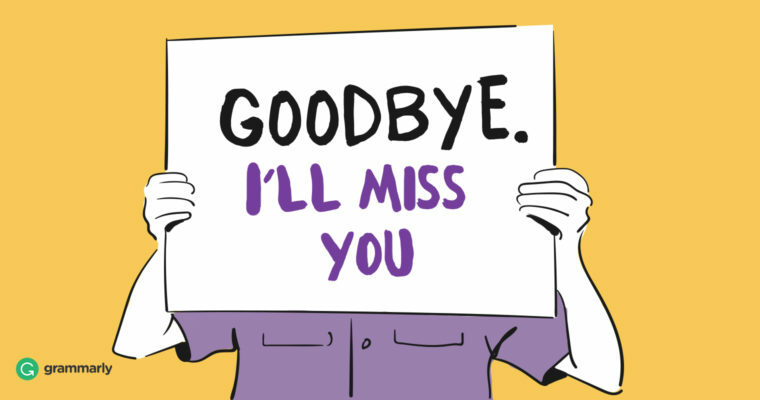 What should you say in a farewell message? It will set the tone for your entire departure, so it’s essential to get it right. Of course, you’re excited about your future, but harping on how prestigious or lucrative your next position is may create jealousy. However, if you sound bummed about leaving, you will give the impression that your next job is (or will be) a dud. Aim for balance. Tell your workmates where you’re heading, but make the focus of the letter about them. You might express gratitude for individuals who helped to train you, reflect on some of your team’s greatest achievements, and make everyone laugh with an amusing anecdote. Close with a few words of fun advice, such as a quote from a respected expert in your field. For networking purposes, include several ways to you. For example, you can include a link to your LinkedIn page, a phone number, and an email address. (You’ll probably lose access to work emails and phone numbers, so personal information is best.) If you don’t have your next position lined up already, ask some key players if you can use them as references. How long should a farewell letter or email be? Do you groan when an extremely long work email shows up in your inbox? Have some empathy! A brief, friendly note will bring feelings of appreciation rather than disgruntled sighs. However, you do want to say enough that your message doesn’t sound flippant. In other words, “See ya!” isn’t thoughtful enough to create the positive vibes you’re aiming for. Whether you send individual or group goodbyes, you can follow the same basic template. That line worked for the Von Trapp children in The Sound of Music, so I thought I would borrow it to say goodbye to you, my fellows at La Compania. These past seven years, first as an intern and later as a data scientist, have been fun and challenging. I will always remember when our team won the city baseball tournament! Each time I watch the highlights of that game, especially when Baxter hit that epic home run, I will remember you all with fondness. My last day will be Wednesday, August 4th. And if I can leave one thought with you, I’d like to borrow the words of James Governor: “Data matures like wine.” I look forward to what we will all accomplish given a few years. I’d love to stay in touch. My details are below. Don’t forget that actions speak louder than words. Besides writing a nice letter, you want to leave a positive impression with the coworkers you’ll be leaving and the new one who will replace you. Why not spend a moment on your last day to reflect on your work space? How should it look for the next person? After all, your working area says a lot about you and your feelings for the company. Make sure your desk is tidy. Remove all personal items from your work computer and the work space. If you want to go the extra mile, leave a note for your successor to welcome them and give helpful hints so they can jump right into the swing of things. Leaving a favorable impression when you leave a job is an important loose end to tie. Give high priority to writing a brief, upbeat farewell letter for your colleagues. If you let your colleagues know about your departure gracefully, your transition will be smooth.